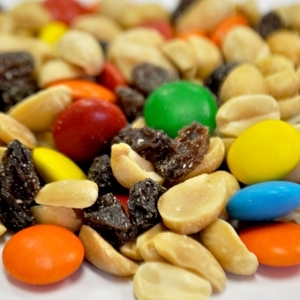 Wholesale Chocolate Trail Mix made with nuts. INGREDIENTS: PEANUTS (PEANUTS, SUNFLOWER OIL, PEANUT OIL, SALT), CHOCO-O-BUTTONS CONFECTIONERY COATING (SUGAR, HYDROGENATED PALM KERNEL OIL, COCOA POWDER, WHEY POWDER, NONFAT MILK POWDER, SOY LECITHIN [AN EMULSIFIER], VANILLA) SEMI SWEET CHOCOLATE (SUGAR, CHOCOLATE LIQUOR, COCOA BUTTER, ANHYDROUS DEXTROSE, SOY LACITHIN (AN EMULSIFIER), VANILLA, SALT, VANILLIN (AN ARTIFICIAL FLAVOR, SUGAR, ARTIFICIAL COLORING (INCLUDES RED 40 LAKE, YELLOW 6 LAKE,YELLOW 6, YELLOW 5 LAKE, YELLOW 5, BLUE 1, BLUE 2 LAKE, BLUE 1 LAKE), GUM ARABIC, CORN SYRUP, CONFECTIONER'S GLAZE), RAISINS (RAISINS, VEGETABLE OIL AND/OR SUNFLOWER OIL), R/S SUNFLOWER SEEDS (SUNFLOWER SEEDS, SALT). ALLERGEN INFORMATION: CONTAINS MILK, SOY AND PEANUTS.